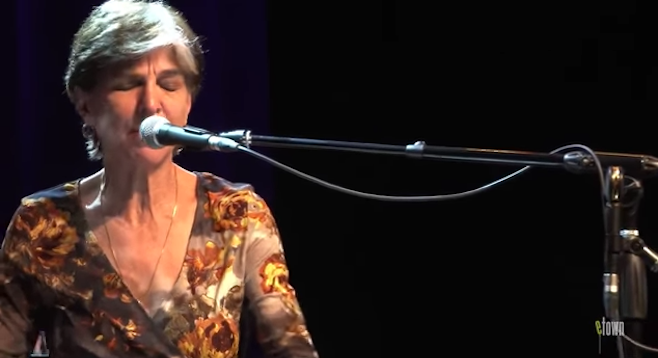 The pedigree is deep and jam-packed with true musical genius for this genre in which Marcia Ball specializes, meaning roadhouse New Orleans swamp boogie. It’s a music that comes out of another time and place in American pop culture, but it still speaks to audiences to this day. The roll call includes such names as Professor Longhair and Dr. John, Huey Smith, Allen Toussaint, and James Booker. Thursday, May 11, 2017, 6 p.m. to 10:30 p.m.
All in all, NOLA piano is kind of a man’s club. But Ball is not without stunning contemporaries such as Honey Piazza, the keyboardist in her hubby Rod’s band the Mighty Flyers. Here in this town, we have a bluesy pianist named Taryn Donath; and Sue Palmer, elsewise known as the Queen of Boogie Woogie. Now 68, Ball broke out of obscurity 16 years ago with a collection of Texas stomp and roots boogie titled Presumed Innocent. Listen to “I’m Coming Down with the Blues” — it’s a song cut from the same cloth as the Fats Domino school of NOLA rhythm-and-blues and it not only demonstrates what a keen student of the form that Ball is, but that she can play it her way. That album made the eventual Grammy nominee into a mainstay on the blues-festival circuit. Ball was born in Texas but was raised near the Louisiana-Texas border, that little swamp-and-skeeter-infested part of the world that fostered so many other fine musicians. Ball is the whole package, a driving stride pianist with a huge book of standards and originals and a voice worn smooth by age and years on the road. If she’s a little too in front of the groove for NOLA aficionados, remember that blues music is flexible and loose and as such is open to interpretation. Ball’s still a good time — like most all blues roots artists, she only gets better with age.